There are a few pieces of Fiesta that are coveted, and this is one of them. 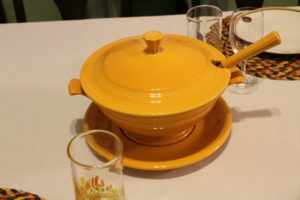 The soup tureen consists of four pieces; the liner, bowl, cover and ladle, and no the handle on the ladle is not plastic, it’s the same clay used in the rest of the pieces. Each set comes with a Certificate of Authenticity that states the piece was made for Fiesta’s 75th Anniversary in 2011 and is limited to only 10,000 sets. Mine is #3775 of 10,000. In preparation for its 75th Anniversary, Homer Laughlin released several collectible specialty pieces prior to the big year-a three-piece mixing bowl set in 2008, a 19 1/2 inch oval platter in 2009 (it’s a whopper! ), and a two-piece prep baking bowl set, along with the traditional Fiesta pieces all in its special 75th anniversary color, Marigold, a gorgeous butterscotch yellow color perfect for autumn! Of course, I got all of the specialty pieces, but that soup tureen is something special. Unfortunately, it was stored in my hellish basement, and the moisture has ruined the box, so I’m not sure what I’m going to do when I put it back in storage (definitely NOT in the basement, I’m working on getting my precious things out of there and use it strictly for storing other things that are not as important to me as my dishes!). I’ll figure something out! In the meantime, I will be enjoying it, as it has been in storage since I bought it in 2011 and it’s too pretty to put away! The coveted Fiesta Marigold 75th Anniversary Soup Tureen-no one touches it but me!